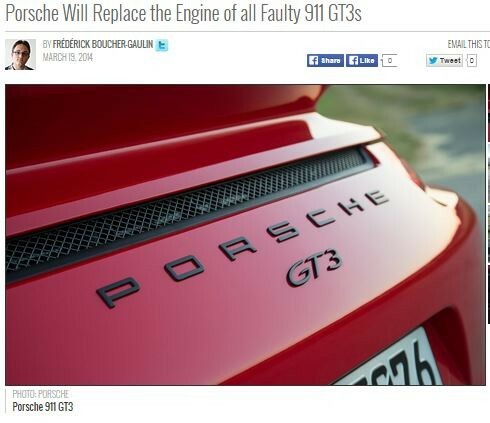 After a few weeks of inspections and testing, Porsche has announced that they will replace the engine of all 911 GT3s presenting the risk of self-immolation. The story started a few weeks ago, when Porsche asked its dealership to halt sales of the GT3, after receiving reports about some vehicles spontaneously catching fire during driving. The manufacturer then contacted the 785 people who bought a 911 GT3, asking them to stop driving their cars until the issue was resolved. Porsche now says that they have found the problem: a connecting rod fastener would loosen up, and during acceleration, the bolt would punch through the engine block (!) and allow oil to leak onto the exhaust system, which is what caused the fires. The solution? Install a whole new engine in all the cars affected. Sadly, critical fastener failures have proven to be a surprisingly common problem in the auto manufacturing industry. Take for example General Motors (GM), which in June recalled about 8.4 million cars due to faulty fasteners as well as other issues. To put that figure in context, the company sold around 9.71 million vehicles in 2013, so GM is recalling almost as many cars as it sold last year. Thankfully, a separate report from TheManuFacturer.com indicated that no passengers were injured due to the GT3’s design flaw. That being said, passengers can sustain serious, if not life-threatening, injuries as a result of defective fasteners. For instance, the recalled GM vehicles were believed to have caused seven crashes, eight injuries, and three fatalities, though the manufacturer maintained that there is no conclusive proof tying their cars to these mishaps. In such cases, vehicle makers can contact fastener consulting firms like GT Technical Consultants to help them determine culpability. Through forensic engineering, such companies can perform failure analysis and provide expert testimony in court, allowing manufacturers to better prepare for the legal ramifications of fastener failure. Such companies can also provide refresher courses on fastener safety to prevent defects and malfunctions from occurring in the first place. While fasteners like bolts and nuts might be miniscule in size, their failure can cause gigantic headaches for manufacturers. Fortunately, they can rely on specialists to help them determine the cause of failure or prevent such problems altogether.